EDITOR’S NOTE: The cases against M25 Investments Inc. (M25) and M37 Investments LLC (M37) include elements that are common in online fraud schemes. For starters, the offers were targeted at senior citizens and people of faith. Moreover, the firms relied on PowerPoint presentations and charts that wowed victims with tales of fantastic earnings. The fraud schemes also traded on the name of a celebrity — in this case, famed investor Warren Buffett. Much of the information in the story below comes from uncontested findings of fact by a federal judge. 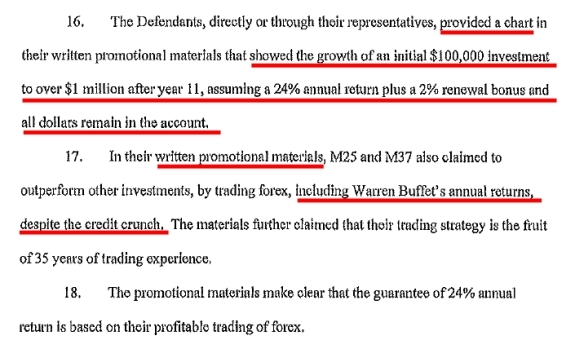 Taken line by line, the CFTC’s allegations upon which the judicial findings were based paint a picture of the sort of fraudulent sales pitches that occur daily on the Ponzi forums and personal websites of hucksters. Spreadsheets that show fabulous earnings projections are in common use in the universe of fraudsters, for instance. So is the use of the name of a celebrity or famous company to sanitize a scheme and disarm skeptics. And appeals to faith are used daily online to separate Believers from their money. Even as this story is being published, members of Club Asteria are doing the sorts of things that led to a two-year legal quagmire for M25 and M37, a litigation nightmare the firms brought on themselves by relying on cheerleaders to drive business, engaging in affinity fraud and then trying to cover it up, according to court filings. Club Asteria members, for example, are using spreadsheets and earnings charts to lure prospects. Meanwhile, they’re trading on the name of the World Bank, citing guaranteed earnings, mixing in appeals to charity and using religious imagery to drive business to the Virginia-based firm . . .
Two Texas firms that targeted a Forex Ponzi scheme at elderly people of faith and others in at least four states have had their registrations revoked by the Commodity Futures Trading Commission. The revocations against M25 Investments Inc. (M25) and M37 Investments LLC (M37) of Waxahachie mean that the firms no longer are registered Commodity Trading Advisors. CFTC’s issuance of the revocations follows on the heels of an administrative action the agency filed in February. The CFTC also sued the firms in federal court two years ago, gaining restitution and penalties of more than $16 million. An administrative law judge found the firms “unfit for registration” last month. Neither firm contested the administrative action. On Oct. 25, 2010, U.S. District Judge Barbara M. G. Lynn found that the firms operated a Ponzi scheme that gained a head of steam by luring customers with promissory notes that guaranteed interest payments of 2 percent a month or 24 percent a year. Neither M25 nor M37 contested the findings. Both firms agreed to an issuance of a consent order with specified penalties and a demand for restitution. The firms neither admitted nor denied the allegations. Business was solicited online and through word-of-mouth, and clients often did not even know the difference between the two firms, Lynn ruled. “Some or all” of the firms’ customers were unqualified investors who did not have the required millions of dollars of assets to become an “eligible contract participant,” the judge ruled. Sales pitches for both firms claimed the ability to outperform famed investor Warren Buffett while making ancillary claims the companies could turn $100,000 into $1 million if customers stayed with them for 11 years and plowed their interest payments and annual renewal bonuses of 2 percent back into the companies. The scheme gathered about $8 million from about 213 customers, the judge ruled, noting that company “representatives” solicited business after church services and in customers’ homes. On March 31, 2009, according to the judge’s uncontested findings of fact, the firms owed customers $7.6 million but had only $3.9 million in total assets. Investors were shielded from the news and issued false account statements showing gains.